Take a look at some fun, family-friendly events this month in Harford County! Happy December! Now that it’s officially the holiday season, Harford County is holding numerous holiday events open to the public. If you live in the area and are looking for a list of family-friendly and fun events for the winter season, look no further! This Sunday is the 28th Annual Christmas parade and tree lighting in downtown Bel Air! The event starts at 2:30 pm with a concert on Main Street in front of the Courthouse, and the parade begins at 3:30 pm, from Main Street to Lee Street to Shamrock Park. The community bonfire and sing along in Shamrock Park starts at 4 pm with free cookies and hot chocolate, with the Tree Lighting at Town Hall following at 4:45 pm. The day will include stilt walkers, acrobats, local high school marching bands, mascots, beauty queens, dancers, floats, musical groups, and of course Santa and Mrs. Claus. On Saturday the 9th from 11am-8pm, St. Mary’s Catholic Church will be hosting a Christmas Bazaar and Festival of Lights to celebrate the holiday season with authentic Eastern European food, vendors, and entertainment at their historic village in Joppa, MD. The village is located at 2807 Mountain Road, and is your one-stop shop for shopping, delicious food and drink, and a place to enjoy the holidays with beautiful decoration! 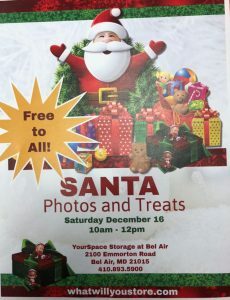 On Saturday, December 16 from 10 am to 12 pm, YourSpace Storage at Bel Air will be hosting Santa photos and treats- free for everyone! The event takes place at 2100 Emmorton Rd, Bel Air, MD. This year marks the 11th Annual Merry Tuba Christmas, located at the Bel Air Armory on 37 N. Main Street, Bel Air. Registration starts at 2 pm; rehearsal is from 2:30-4pm; and the performance is from 5-6pm. Bring your tubas, a music stand, and dress festively to make this event even bigger! There is no admission fee for the audience. For a full list of events, head to HarfordsHeart’s event calendar. Whether you need your very first apartment home or are relocating to the area, Apartments of Harborside Village would love to be your dream apartment home. Looking for beautiful water-front apartments in Joppa, Maryland? Let us show you one of our spacious and affordable apartments at the Apartments of Harborside Village. To learn more about our apartment options, visit us online, give us a call at 410-679-1130, or email us. For a peek at what it’s like to live in our community, follow us on Facebook, Twitter, Pinterest, Google+, and YouTube! This entry was posted on Friday, December 1st, 2017	at 5:23 pm	. Both comments and pings are currently closed.